This ocean-inspired necklace features gold sea stars representing children or grandchildren. A wearable family portrait of organic sophistication, Catherine Weitzman's My Lucky Stars necklace offers a subtle and elegant alternative to reflect the unique bond between mothers and their children, or between grandmothers and their grandchildren. 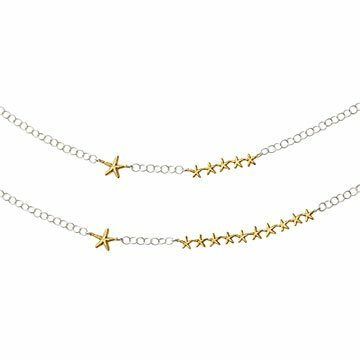 Set along a sterling silver "bubble" chain, a single large star and five to ten smaller stars (cast from real starfish) of 18k gold vermeil represent your family constellation. The bubble chain and starfish complement one another in a continuous, ocean-inspired tribute to a mother or grandmother's most precious stars--combining elegance with heartfelt, integral personalization. It's a thoughtful tribute to mothers and grandmothers, and a distinctive gift for Mother's Day or birthdays. Handmade in Hawaii. For necklaces with a single star up to 4 small stars, check out the My Lucky Stars Necklace. For more from the My Lucky Stars Collection, take a look at the Our Lucky Stars Necklace and the My Lucky Stars Earrings. For a set of starfish studs, check out the Starfish Earrings. Through a subtle, natural metaphor of linked, gold starfish (cast from real starfish) Catherine Weitzman's My Lucky Stars Necklace represents the loving bond between a mother and her children (personalized through choice of number of children or grandchildren). The silver "bubble" chain adds another ocean-inspired dimension to the design. Sterling silver and 18K gold vermeil—natural source materials. My Lucky Stars Necklace is packaged in 100% recycled cardboard boxes (made with 90% post-consumer fiber and 10% pre-consumer fiber), covered with recycled paper. The boxes contain anti-tarnish poly-fill. There's one place—and only one place—where you'll find the My Lucky Stars Necklace: UncommonGoods. Length: 18", Large star: .5" , Small stars: .25"
Disappointed with size of stars, too small, can't tell they are starfish! Also, nine is too many for such a short necklance, hangs lopsided. Doesn't look as much as paid for.